Prior to using the Hiring Tools, you will need to have set up at least one ThinkWise Competency Model. Hiring managers who use the Hiring Tools will use a Competency Model as a starting point. ​1. Make decisions on how Hiring Tools will be used. ​What do we hope to achieve by implementing the ThinkWise Hiring Tools? To develop a more disciplined, predictable hiring process that will reduce candidate cycle time, improve process consistency, improve the candidate experience and result in an increased new hire success rate. To enable hiring managers to identify specific hiring requirements, using common language and generally familiar competency models. To engage the right people in the interview process and prepare them to conduct interviews, asking the right questions that target key competencies for success on the job. How will the various stakeholders be involved in using these tools? Think through how the ThinkWise Hiring Tools will fit within your existing hiring processes, and what elements of your current processes will change. You can use as many or as few of the ThinkWise features as you want. For example, you may choose to use the candidate surveys and interview guides, but not use the interview feedback tools and reports. As a starting point, decide who will set up new hiring projects in ThinkWise. Hiring projects can be initiated by a central person in the HR/Staffing function, or by individual hiring managers. In either option, make sure those involved are clear on their role and what they are expected to do. ​Will you use the ThinkWise Hiring Tools for both internal and external selection? The ThinkWise Hiring Tools work just as well with internal job postings as external postings. Candidate surveys can be sent to internal employees, regardless of whether or not they are ThinkWise subscribers. If you do use the tools for internal selection processes, it is a good idea to let your internal employees know what to expect as they go through the process. 2. Update/confirm your Hiring Tools Launch Plan. 3. Customize the Hiring Tools communication materials. Review the decisions you made about who will be involved and what you need to tell them. Use the templates provided in the Hiring Tools to customize an e-mail announcement to recruiters or hiring managers to let them know about the tools and the decisions you made. Also, customize the resources below to share during meetings or training sessions. 4. Train recruiters or hiring managers how to use the Hiring Tools. 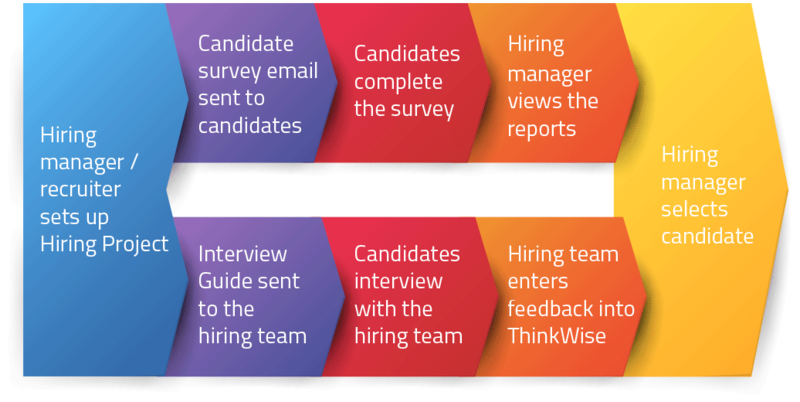 Use the “How-To” Guide to train recruiters and managers who will be using the Hiring Tools within ThinkWise. 5. Follow up and monitor progress. Regularly check in with leaders across the organization to monitor how well the Hiring Tools are working for them. For those who have not yet used the Hiring Tools, explore their reasons and look for ways to encourage and support their usage. ​Make the most of the ThinkWise Hiring Tools. It is not necessary to have all applicants complete a Candidate Survey. Use the assessment as a tool to help distinguish between finalists with generally comparable technical skills and qualifications. When using the Interview Guides, have multiple interviewers each focus on some of the competencies so all are covered. All interviewers do not have to ask all questions. Encourage the interview team to refrain from discussions about the candidates until after each interviewer enters their comments and ratings in ThinkWise. This will help lessen bias and increase objectivity. Be clear in communicating how the ThinkWise Hiring Tools fit in with the normal recruitment and selection process. Review the What/Why/How information on the Hiring Project Dashboard in ThinkWise. These resources will provide you with a basic context of and understanding about the Hiring Tools and how they work. How and when will the changes take place? How will this impact me? What do I have to do?